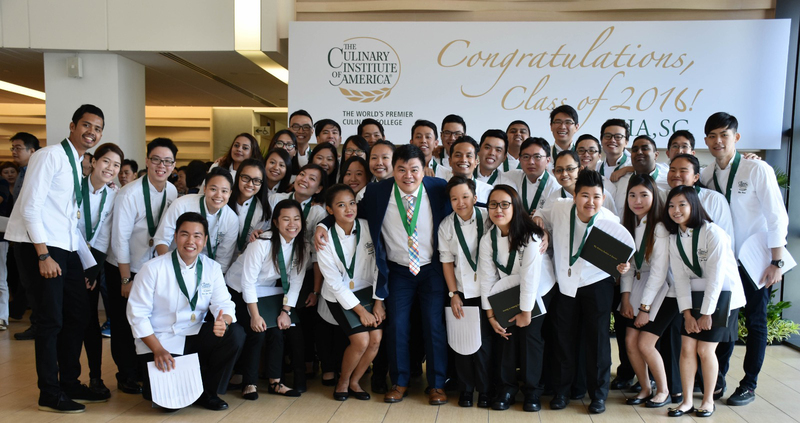 Singapore – Loh Lik Peng, founder and director of the Unlisted Collection, delivered the commencement address to graduates of The Culinary Institute of America on September 15. Unlisted Collection is an umbrella brand that comprises high-quality hotel properties and restaurants in Singapore, London, Shanghai, and Sydney. Mr. Peng advised 38 bachelor’s degree recipients to be original. At age 42, Mr. Peng has already earned many career honors, including the Lifetime Achievement Award at the 2016 World Gourmet Summit, the 2011 Tourism Entrepreneur of the Year Award at the Singapore Experience Awards, and the 2004 New Tourism Entrepreneur Award from the Singapore Tourism Board. Despite his success, Mr. Peng told graduates he has also had many setbacks during his career. He relied on good people to help him through difficult times. “Surround yourself with people who matter. Never be afraid to ask for help and never be stingy when someone asks for your help,” Mr. Peng advised. These graduates began their CIA studies in partnership with the Singapore Institute of Technology in 2014 after completing a three-year polytechnique diploma programme. Credits from previous business management courses transferred, allowing students to complete their four-year degree with two years of the CIA’s unparalleled hands-on culinary training and certain required liberal arts courses. Established in 2009, SIT is an institution funded by the Ministry of Education offering undergraduate degree programmes primarily for polytechnic graduates. In partnership with various reputable overseas universities, SIT has brought to Singapore some of the world’s top industry-focused degree programmes targeted at growth sectors of the economy. Through a unique tripartite collaboration with its overseas university partners and the five local polytechnics, SIT represents a new model that is set to become a key pillar of university education. SIT has been slated to become the fifth public university in Singapore by the government.